Chefs around the region are pulling out all the stops to serve up some of the photogenic food to celebrate Chinese New Year. Here are six quirky, delicious, good-looking creations from Hong Kong, Taiwan and Singapore that you’ll want to eat with your eyes — and cameras — first. 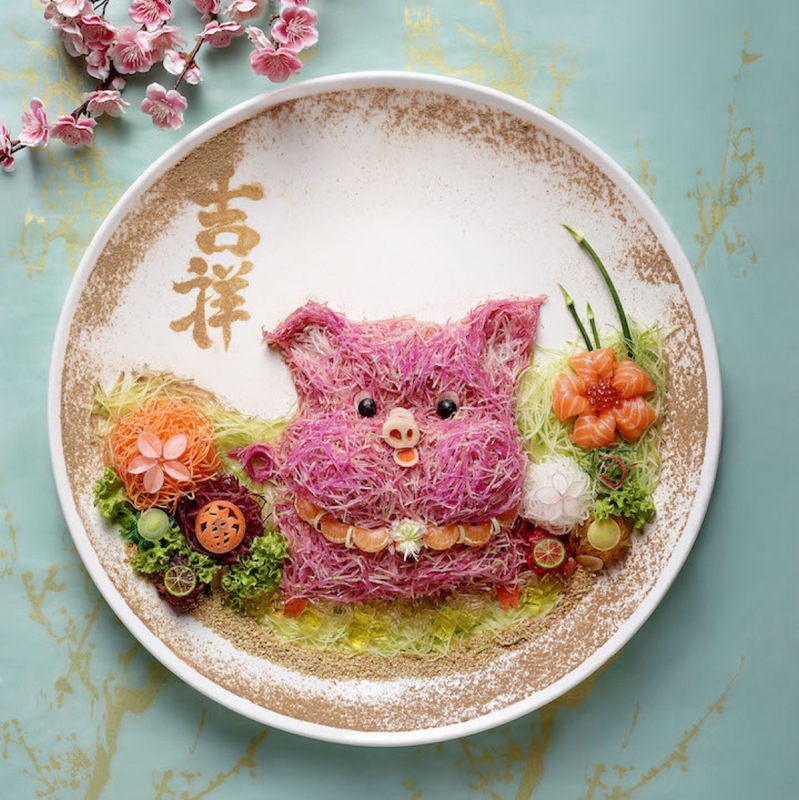 The Fullerton Hotel Singapore’s Chinese executive chef Leong Chee Yeng is known to be quite the artist and this Chinese New Year, he shows off his creativity at Cantonese restaurant Jade with the Gold Rush Yusheng. Featuring lobster, Australian abalone and Norwegian salmon, the picture-perfect masterpiece comes with pink radish artfully arranged to resemble a cute piglet — a laborious operation that requires one and a half hours. Chef Pang Kok Keong marries French pastry-making techniques with Chinese symbolism and flavours to create Abundantly (Banner Pic) — a lusciously textured chiffon cake infused with rich purple sweet potato and topped with a thin circle of black sesame peanut feuilletine. The Instagram moment comes as diners slide off a little partition that releases a flow of salty cheese cream that drapes over the cake. The cake is crowned with black and gold tapioca bubbles steeped in black sugar, lightly candied sweet potato and yam cubes, and gold-covered chocolate ornaments. 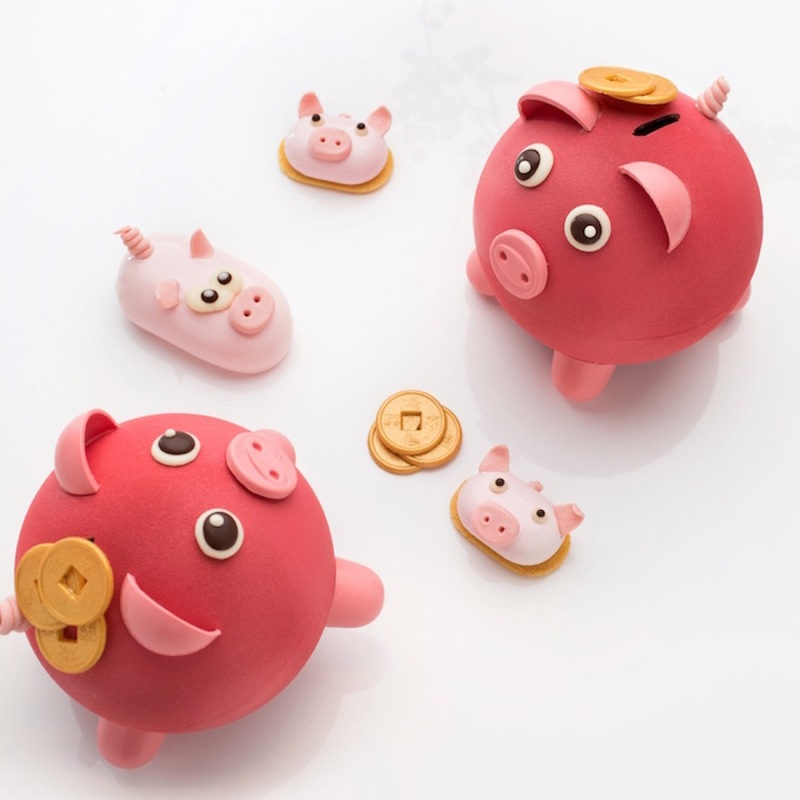 Inspired by vintage children’s piggy banks, Grand Hyatt Taipei’s French pastry chef Julien Perrinet has created his Piggy Bank dessert for the hotel’s Baguette Bakery on the first floor. Made with 64% dark chocolate and filled with pistachio, diced orange and other auspicious dried fruits, each adorable pink piglet also contains chocolate coins, a symbolic welcoming of riches for the new year. Wu Er is famous for its delicate handcrafted Chinese-style snacks made from the highest quality ingredients. 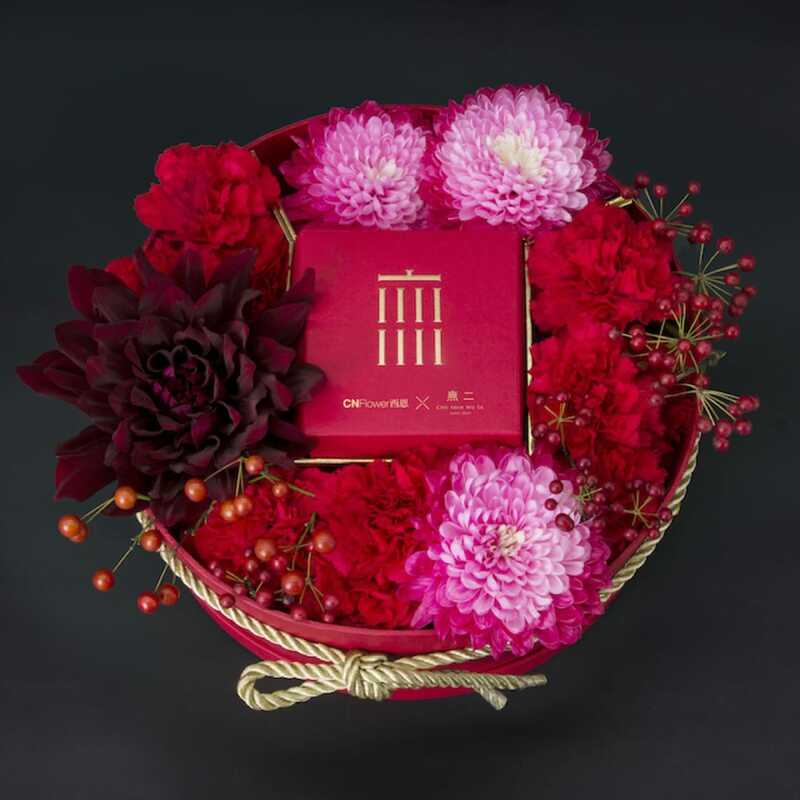 For Chinese New Year, Wu Er’s premium snacks — pine nut osmanthus cakes, fragrant peanut crisps, red quinoa and cashew nut crisps with sticky brown sugar, and date-plum cakes — come beautifully packaged in gift boxes designed by Taipei’s leading floral atelier CN Flower. 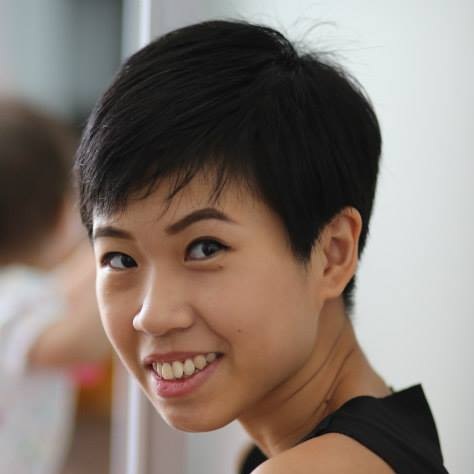 Founded by Vivien Lau in 2014, the gorgeous, intricate creations at VIVE Cake Boutique like its signature Uni-cone cakes and mirror-glazed desserts are an Instagram lover’s dream. 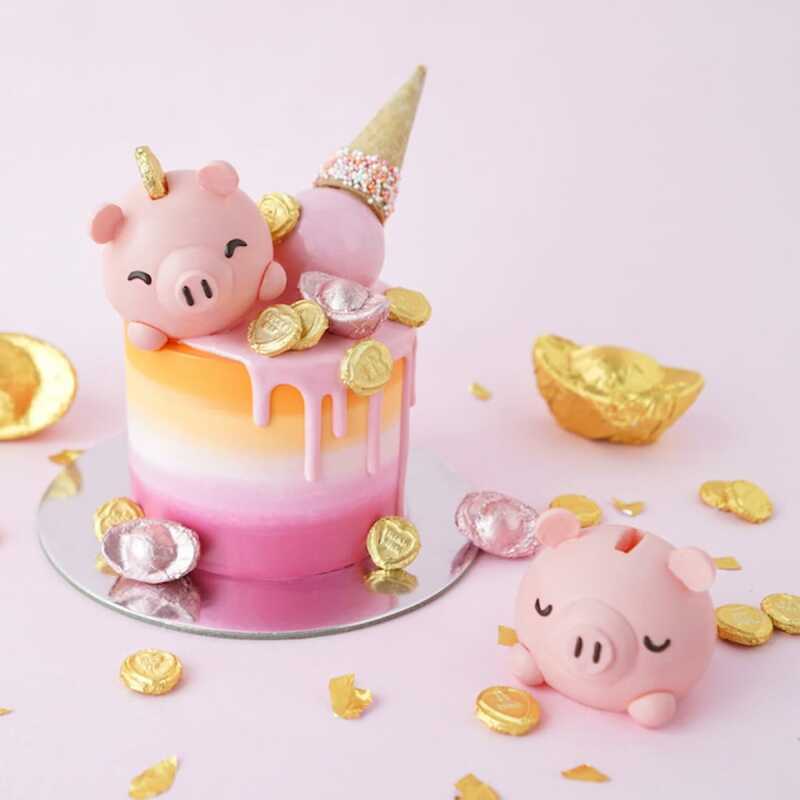 For the festive season, the highlight is the fantastical Fortune Piggy, a white chocolate piggy bank and VIVE’s iconic Uni-cone atop a multi-coloured cake decorated with gold ingots and coins. 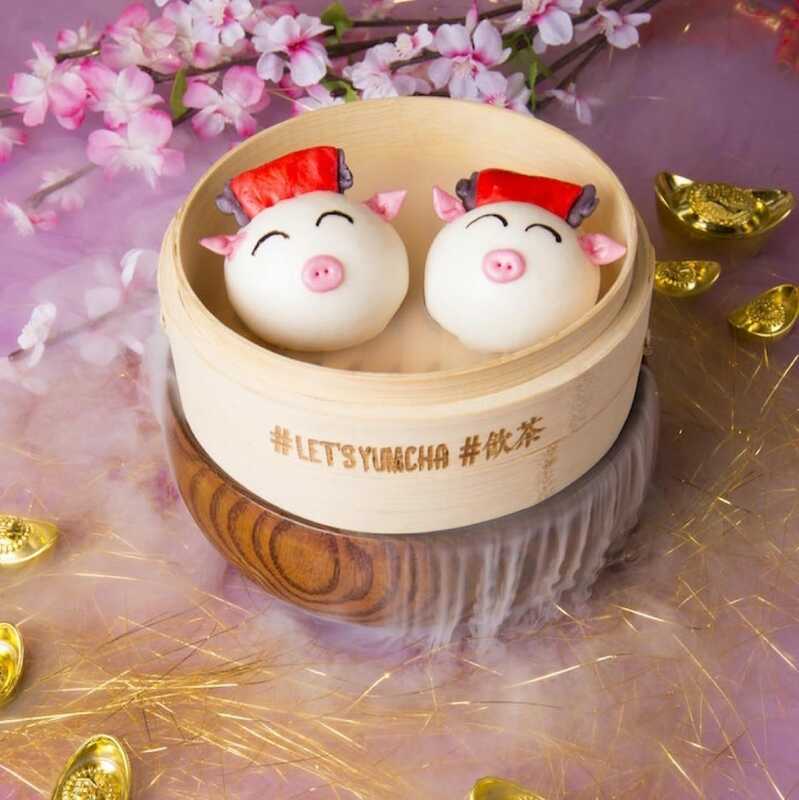 This quirky, casual restaurant with four outlets across Hong Kong is known for its adorable dim sum offerings made to look like cartoon characters, birds and flowers. Each dish is more photogenic than the last and diners are encouraged to eat with their cameras first. For Chinese New Year, the smiling piglets in the signature BBQ Piggy Buns are dressed with red hats to look like the God of Fortune.